Tantalum is used for microelectronic applications, there is a barrier layer consisting of firstly tantalum and then tantalum nitride, followed by a seed layer of copper. Silver, Ag, Iridium, Ir, Ruthenium, Ru, Palladium Pd, Lanthanum La, Cerium Ce, Praseodymium Pr, Neodymium Nd, Samarium Sm, Eur , Eu, Gadolinium Gd, Terbium Tb, Dysprosium Dy, Holmium Ho, Erbium Er, Thulium Tm, Ytterbium Yb, Lutetium Lu, Scandium Sc, Yttrium Y, Silicon, Si, Tellurium, Te, Bismuth, Bi, Tin, Sn, Zinc, Zn, Boron, B, Lead, Pb, Antimony, Sb, Chromium, Cr, Cobalt, Co, Aluminum, Al, Nickel, Ni, Titanium, Ti, Tungsten, W, Molybdenum, Mo, Tantalum, Ta, Niobium, Nb, Zirconium, Zr, Hafnium, Hf, Vanadium, V, Germanium, Ge, Indium In, Copper, Cu, Iron, Fe, Manganese, Mn, Magnesium, Mg, Cadmium Cd, etc. 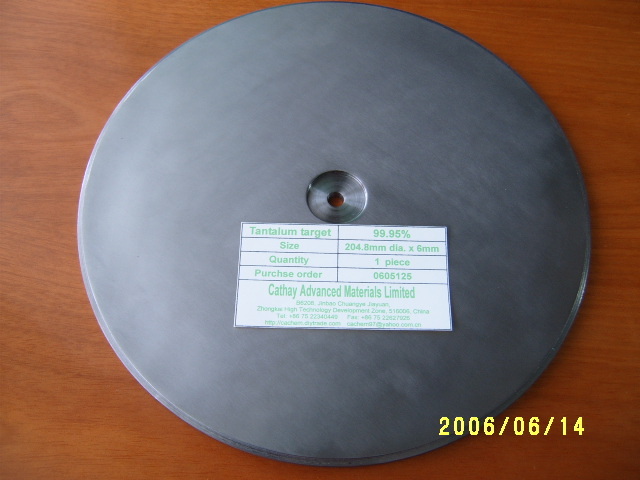 Cadmium Sulfide CdS, Copper Sulphide CuS, Cadmium Telluride CdTe, Lead Telluride PbTe, Mercury Telluride HgTe, Indium Telluride In2Te3, Antimony Telluride Sb2Te3, Bismuth Telluride Bi2Te3, Gallium Telluride Ga2Te3, Tin Telluride SnTe, Zinc Telluride ZnTe, CuInGaSe, In2Se3, Ga2Se3, CuInSe2, CuInS2, Zinc Stannate (Zn2SnO4), Cadmium Stannate (Cd2SnO4), SnO2, SnCl4, ZnO, Molybdenum, Indium, ZnS, ZnSe, InSb, InAs, In2S3, CuGa, Cu2S, Cu2Se. Used as a high brightness thermionic emission materials because of its low work function, high melting point and high metallic conductivity. LaB6 cathode for Leybold 1104 coating machines for precision optical coating is our advantage. We produce LaB6 powder, LaB6 disc, LaB6 tablet, LaB6 target, LaB6 rod, LaB6 crucible, LaB6 sector ring, LaB6 tube (hollow cathode), YB6 rod, CeB6, PrB6, NdB6, SmB6, EuB6, GdB6, TbB6, DyB6, HoB6, ErB6, TmB6, YbB6, LuB6, ScB6, (LaBa)B6, (LaEu)B6, CaB6, etc. Cathay Advanced Materials Limited All rights reserved. B6208, Jinbao Chuangye Jiayuan, Zhongkai High Technology Development Zone, Guangdong, 516006, P.R. China.